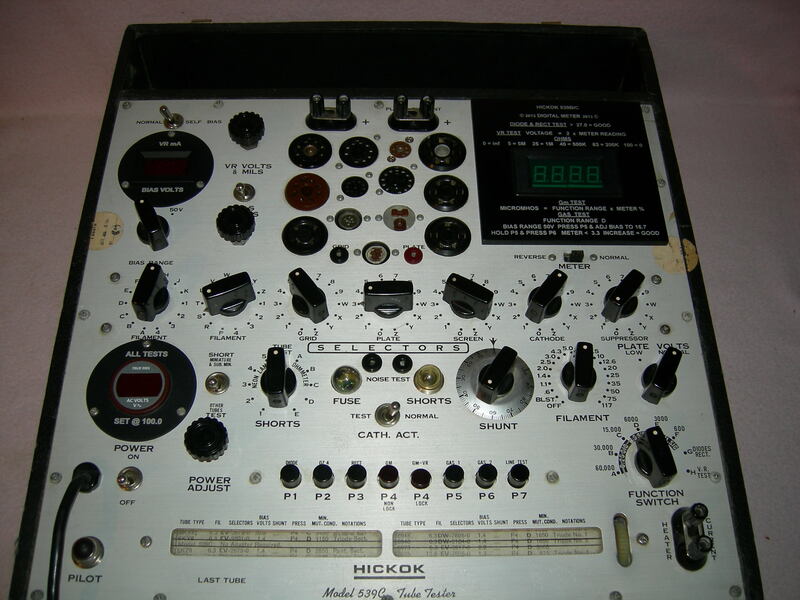 I calibrate and repair Hickok, Precision and some other brands of tube testers. The services provided are described here. Contact me about a tube tester you’d like to have calibrated. At this time I don’t do Military or Hickok Cardmatic tube testers. Hickok tube testers are Mutual Conductance tube testers and are highly prized for their quality. 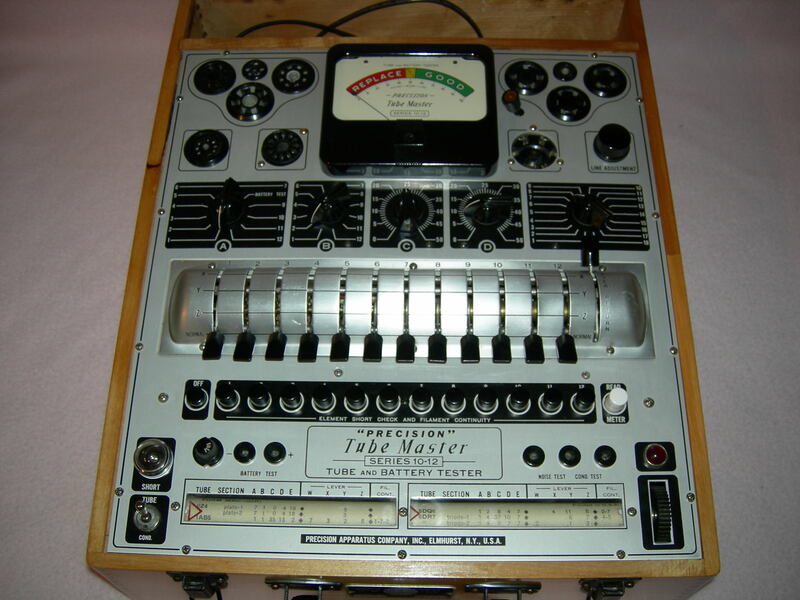 If you want to match tubes, you need a Mutual Conductance tube tester. Some of the Hickok tube testers do not have enough resolution in the readings to match tubes. The Hickok 539 series, and the 750/752 series are some of the best for tube matching. Your tube tester cannot be repaired if the Bias potentiometer is bad. They were made custom for Hickok tube testers and are no longer available. If you have a tube tester with a bad Bias pot, consider it a boat anchor. It cannot be repaired unless you salvage a Bias pot from another tube tester. Insure proper fuse lamps are installed. Replace as necessary. Clean controls and switches as necessary. Replace capacitors as necessary to insure accurate testing. Check and calibrate shorts testing. 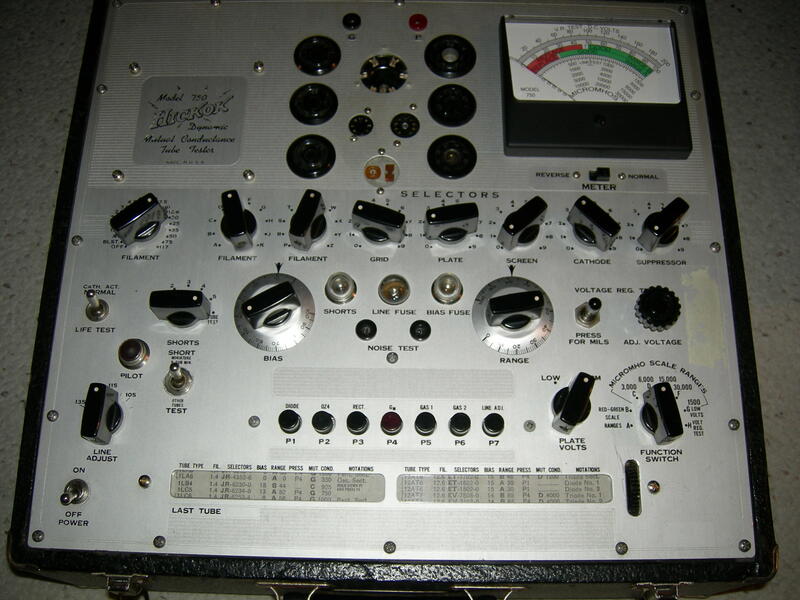 Check overall calibration of the tube tester with various tubes – power, rectifier, and pre-amplifier. Repairs to get the tube tester operating properly. Replace vacuum tube rectifiers. The #83 tube is getting scarce and expensive. I recommend converting to solid state rectifiers. Convert to solid state rectifiers. This requires circuit modifications. The meter movement should be operational and within specifications. Bias control working. There are no replacements for the bias pot. All knobs must be present. Calibration starts at $165. The 539 and 752 series of tube testers start at $245. Contact me and let me know that the tube tester is coming. Ship the unit and be sure it is packaged properly and insured against loss or damage. I cannot be held responsible for shipping damage. If you choose not to have your tube tester repaired and calibrated there will be a $45 diagnostics charge. Hickok 539C restored, calibrated, and with digital meters installed. 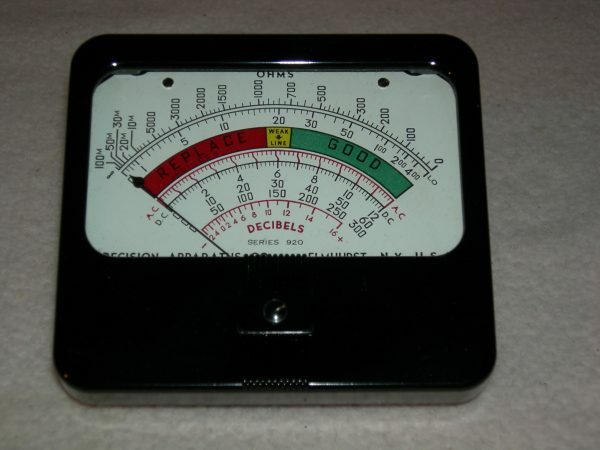 I can convert your Hickok 539B/C Bias, Line, and Gm meters to digital meters. The addition of digital meters offers a higher level of accuracy and reliability to an exceptional Hickok tube tester. All three meters will be replaced with digital equivalents and the tester calibrated. If you want the most reliable and accurate measurements from your vintage Hickok tube tester, this is a great way to go. The digital meters will not have the mechanical issues like the analog meters and are not prone to overload damage. Tube testers with square Bias and AC Meters cannot be converted to digital meters. The calibration is as stated above for Hickok Tube Testers.Digital meter replacement and calibration of the tube tester is $700. Contact me and let me know that the tube tester is coming. Ship the unit and be sure it is packaged properly and insured against loss or damage. I cannot be held responsible for shipping damage. If you choose not to have your tube tester repaired and calibrated there will be a $45 diagnostics charge. Precision Tube Testers were manufactured by the Precision Apparatus Corporation from the 1940s to the 1960s. I have restored quite a few Precision tube testers, and I am quite impressed with the craftsmanship and quality in these vintage units. I really like the old wood cases. They are all Emission type Tube Testers. Precision’s “Electronamic” design in some models of Tube Testers was an attempt to improve on the basic Emission tube testing principle. Some of the models included VOM functionality. Precision called this “Set Analyzing”. I try the best I can to restore the VOM functions in these old testers. I have come up with modern replacement battery systems so the Ohm Meter functionality will work properly. It is amazing that the VOM functionality in these old testers is still quite accurate after all these years. Most of the testers include battery testing functionality. Batteries are tested with a load resistor and will show the condition of a battery under load. I generally do not bother with this functionality. The value of having the battery testing feature is not worth the cost and effort to troubleshoot and repair. Most of the time it works properly anyway. They have a one-year warranty that does not include burning out of the meter movement. Tube tester meter movements are very delicate and can be burned out very easily by testing a shorted tube, or from improper test settings. I find the most common functional failure with these old testers is bad meter movements. I will also purchase any Precision tube tester or parts you may have. Email me with what you have and I will make an offer. Let me know if the unit works and what parts are missing. Include a picture so I can evaluate the unit. Insure proper fuses are installed. Replace resistors in the tube testing circuit related to calibration. Replace capacitor in shorts indicator circuit and resistors as necessary. Clean controls and lubricate push button/lever mechanisms as necessary. Verify calibration with known quality tubes – power, rectifier, and pre-amplifier. Replace power cord and/or Elmenco fused plug. Replace 4.5 volt battery for “Set Testing” operation. Replace rubber feet on case. The meter movement must be operational and within specifications. The shorts indicator must be the proper one for the tube tester and working. I now have replacement meters for the Precision 920 and 10-12 tube testers. Send your tube tester and I will replace the meter, lubricate the controls, and calibrate the tester. If your tube tester is is good condition, you can bring it back to life and extend its useful life by replacing the meter. The meter is the most common failure in the old tube testers and once replaced should last a long time. The newer meters are more robust and will handle incorrect settings of the tester a lot better than the older meters. The calibration is as stated above for the Precision Tube Testers. Meter replacement and Calibration is $245. Contact me and let me know the tube tester is coming. Ship the unit and be sure it is packaged properly and insured against loss or damage. I cannot be held responsible for shipping damage. If you choose not to have your tube tester repaired and calibrated, there will be a $45 diagnostics charge. 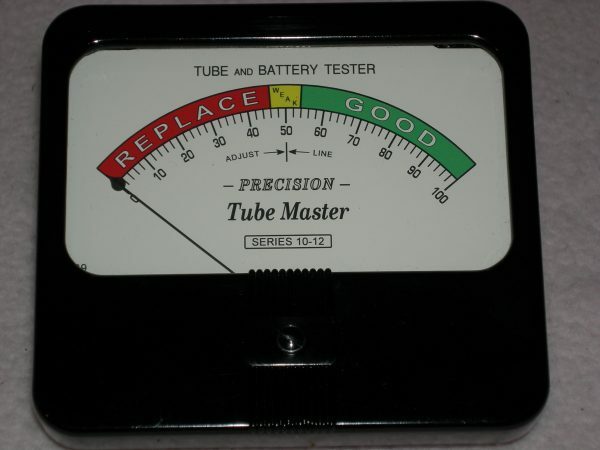 Contact Me and I can go over your options for repairing and calibrating your tube tester.